It’s Wednesday in the Weak Day Wines tasting (living) room and time for something completely different. This 12% Pinot Noir is grown just two miles from the Atlantic Ocean. We’ve visited Chenin Blanc from Uco Valley and a Malbec rosé from Luján de Cuyo, and now, Pinot Noir from Argentina’s Atlantic Coast. These little guys have never seen a mountain, much less know how to spell it. 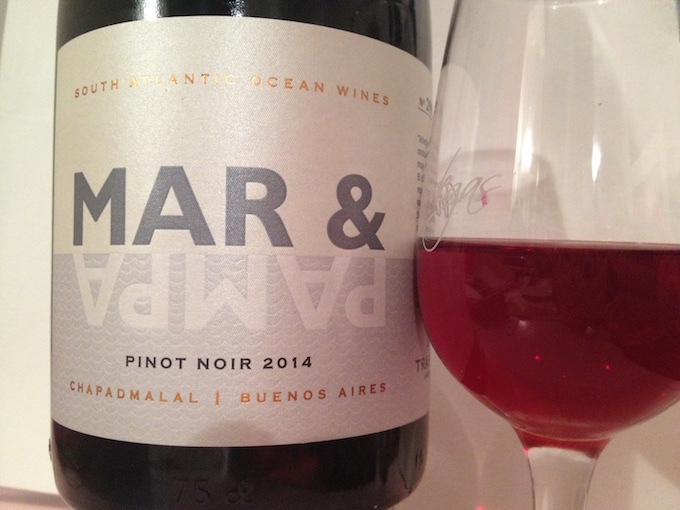 Introducing Mar & Pampa Pinot Noir 2014, Mar & Pampa by Bodega Trapiche, Chapadmalal, Buenos Aires province. 145 pesos. Mixed cork. Anything else notable? Wholly notable, because this Pinot Noir – and its Riesling, Chardonnay, Sauvignon Blanc and Gewürztraminer siblings – is grown just two miles from the Atlantic Ocean. That’s NOWHERE NEAR THE ANDES, Argentina wine map fans. And while cool coastal climates are a dime a dozen in the rest of the world, it’s a very new thing here. So new, that everyone thought parent bodega Trapiche had been slapped with a loco stick. Thank god they had the balls to give it a go. Fun fact: My bottle from this first vintage is numbered 2998. Taste me because: I’m Argentina’s first Pinot Noir grown in a coastal climate! And because I’m a fairly decent Pinot! Pale ruby as expected, with a fruity, lightly spiced nose, with hints of vanilla and nutmeg. Happily, it’s also a little earthy. Cherry and strawberry dominate. Mid high acidity, refreshing, fruity with plenty of wild strawberry, just ripe cherry and a little boiled sweet in the mouth. Serve at 14ºC. A 175ml glass of wine at 14% = 2.45 units.